Abstract: For over two decades policy makers have sought to dismantle the infrastructure for face-to-face encounters, driven by pressures to reduce costs, offer convenience and attempts to maintain control. Amid the largescale introduction of contact centres and self-service websites the contribution of authentic human interaction has become devalued. At a time when relations between citizens and public servants are under strain, this talk argues the sustained efforts to design out possibilities of face to face public encounters serve only to further to distance citizen and state. Through a series of case examples the talk seeks to consider the possibility that the current and growing interest in Artificial Intelligence may well be reinstating long neglected discourses of human authenticity. 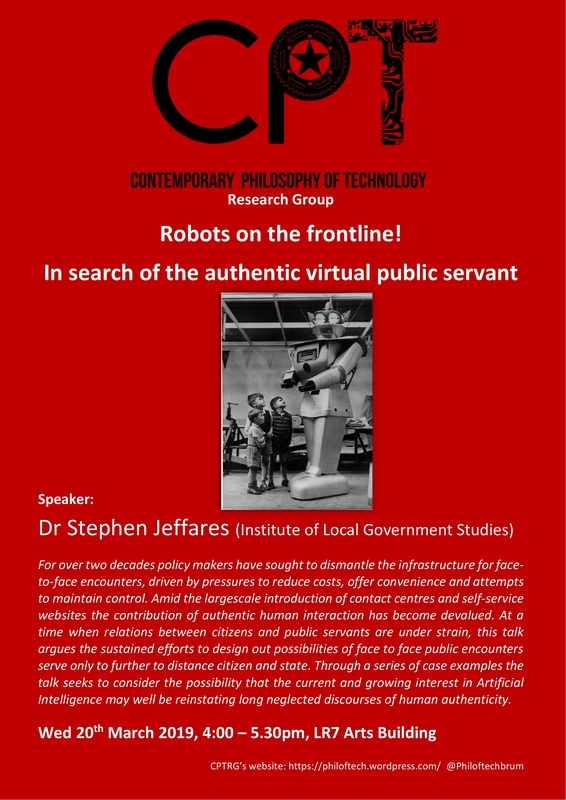 Bio: Stephen Jeffares is Senior Lecturer in Public Policy at the University of Birmingham. His research documents how public servants experience and contribute to discourses of public service reform.